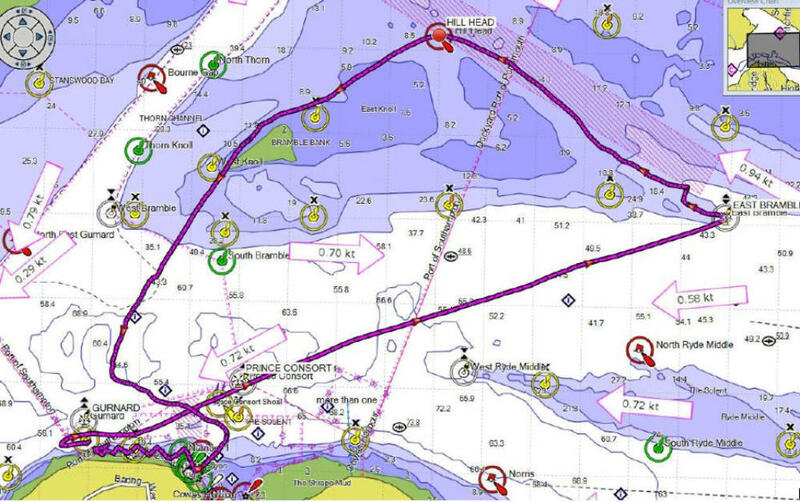 As the forecast was for light shifty winds and the possibility of it dropping off completely around lunch time the sensible decision was made to not send us to the Owers but around a short Solent course. 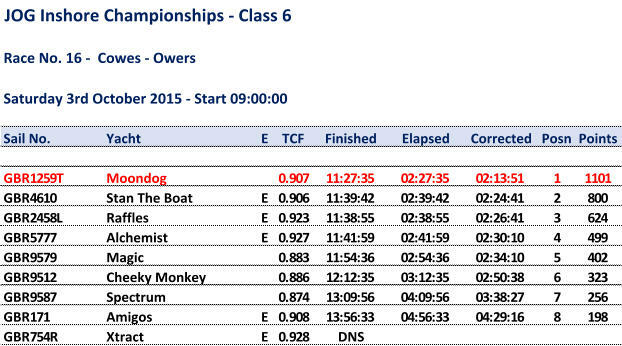 Quite a good start as we drifted over the line but Stan The Boat got away with their kite up to gain a decent lead. Had the kite up for the first part of leg one but dropped it as the wind headed us and kept up well with the three leading boats as we approached East Bramble. Good beat to Hill Head where we over hauled Stan The Boat and Alchemist who had chosen a mainland course. On rounding Hill Head we hoisted the asymmetric kite and flew it from the pole, once the sheet was put back on the clew and the head untangled from the mast fitting. Chose to go North of the Bramble Bank with Stan The Boat heading straight for Gurnard South of the Bank which we thought would not pay as they should have been plugging more tide but they overtook us quite easily so it was the right way to go. As we approached Gurnard a shortened course was announced so we were now heading for the finish. Both Stan The Boat and Raffles were parked up at Gurnard as we arrived and they decided to kedge in the strong tide, possibly hoping for the breeze to fill in. We decided to head inshore to get out of the tide if we could and in the process nearly collided with Raffles. Dropped back a considerable distance (0.6nm) from the finish in getting inshore but once level with the barrage we were able to start moving forward in the slack tide. Tacked up the shore with Windjammer (class 5 J97) in close attendance and with the breeze seeming to fill in a bit we made the finish easily for line honours and a class 6 win by over 11 minutes.